Quality is one of the nine Project Management knowledge areas. The project quality plan is developed to assure the quality of the project outputs. It addressses how quality will be assured and controlled throughout the project lifecycle. PMBOK* (2008) defines Quality Assurance as the “process of auditing the quality requirements and results from quality measurements to ensure appropriate quality standards and operational definitions are used”. 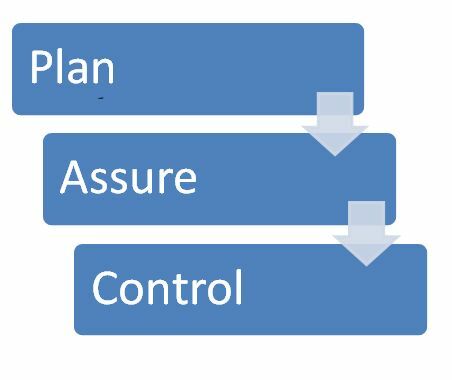 Quality Control, as defined by PMBOK (2008) is the “process of monitoring and recording results of executing the quality activities to assess performance and recommend necessary changes”. Quality control activities are performed throughout the project. A sound quality process uses both prevention and inspection to insure quality products, services and outputs. How does your organization and project address quality? What can you do to improve the quality process in your organization and project? Project Management Institute (2008). A Guide to the Project Management Body of Knowledge Newtown Square, PA: Project Management Institute, Inc.